From elegant abstractions to eye-popping canvases splashed with filmdom’s top freaks and ghouls, there’s a little something for every art lover in October. Kustom Kulture sculptures of inflated steel, small works by some art world heavy hitters, and an arty fest for everyone round out a month of major happenings. The Safe Room Gallery at the Texas Theatre is known for its quirky mix of art both high and lowbrow. Firmly in the latter category are the scream-worthy scenes portrayed by local painter Clay Stinnett, whose cartoony style you may recognize from his recent animated video for The Toadies. Embracing all that’s weird and wild about pop culture — People of Wal-Mart and Star Wars among them — Stinnett couldn’t help but choose classic horror shows for an exhibition slated during the month of Halloween. You’ll find homages to The Texas Chainsaw Massacre, The Shining, Evil Dead — even The Goonies — in Stinnett’s macabre mix of oils and airbrush. His lurid style may not be for everyone, but the passionate following that hang on his every social media move on Instagram (@cath0rse) are certainly enthusiastic. Stinnett admits he doesn’t quite fit in the high-end gallery scene, but that’s just fine with him. His unrestrained canvases have a lively appeal that everyone from young collectors to rock stars can’t help but love. Kustom Kulture (the art, vehicles, and fashion inspired by candy-colored hot rods) is at the heart of the incredible, inflated sculptures by William Cannings at Cris Worley Fine Arts this month. Raised in England but ending up in Lubbock (where he heads up the sculpture department at Texas Tech University), Cannings’ background working with auto materials led him to keep a hands-on approach to his work. Where other artists may send out their pieces to be fabricated, he hand-hammers flat sheets of steel, welds them together, heats them, then literally blows them up with air in a process that is decidedly volatile. 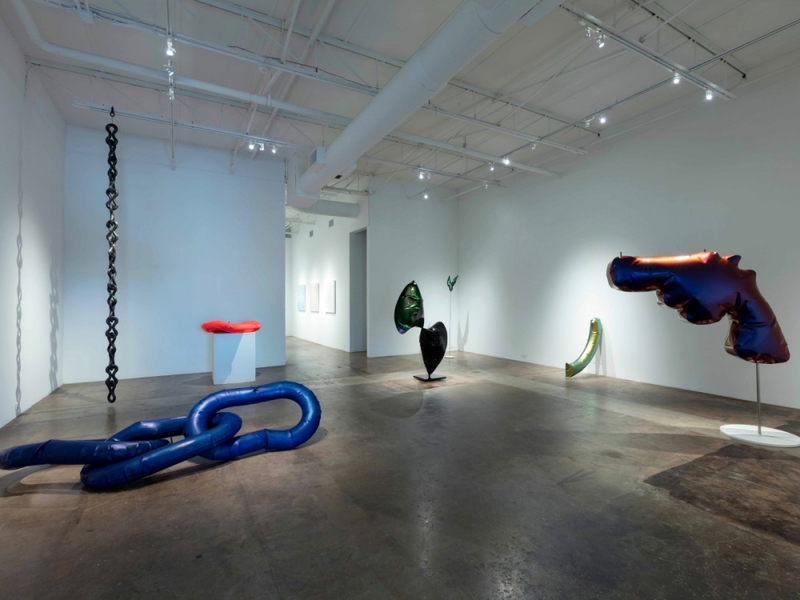 The popsicles, knots, and abstract shapes (one of which, “Air-MESS,” plays with the idea of the winged Greek god) may look like fun-loving inflatables, but there’s a darker side to Canning’s sculpture. A snub-nosed pistol modeled after the gun used by radical feminist Valerie Solanas to shoot the artist Andy Warhol is spookily prescient in its social commentary. Although different in aesthetic, the works of Lorraine Tady and Leslie Wilkes both traffic in the practice of sacred geometry and spatial memory. Barry Whistler encountered the two together when installing a Wilkes show at Austin’s Women & Their Work accompanied by an essay by Tady. The duo’s rigorous approach to their visual vocabulary makes them a clever, if occasionally uneasy, pairing for a dual show. Curious, perhaps but definitely timely — the show opens right before the 2x2 For AIDS and Art Auction next weekend, which also features a piece by Tady in its stellar selection of biddable works. If you’ve ever longed to time-travel to the more freewheeling art scene of the 1990s, The Box Company’s current show offers a fun flashback to the late-‘90s output of local artist Ludwig Schwartz. Originally encountering Schwartz’s work at David Quadrini’s now-defunct Angstrom Gallery, arts writer and curator Charles Dee Mitchell was inspired enough by the artist’s irreverent sensibilities to bring back pieces previously exhibited at the likes of the Institute of Contemporary Art in London and the McKinney Avenue Contemporary for modern audiences. Schwartz’s punny papers definitely fit that bill. A far cry from his current abstract canvases shown by Conduit Gallery, these impish pieces fueled by political unrest harken back to a time when art — and the world that inspired it — didn’t have to take themselves quite so seriously. With pieces by local favorites such as Chivas Clem, Daniel Driensky, Will Heron, Anna Membrino, Francisco Moreno, Nic Nicosia, JM RIzzi, Rob Wilson, Kevin Todora, and Zeke Williams, — plus others around the country — the mix of viewpoints makes this “Small” show kind of a big deal. One of Fort Worth’s most anticipated art events, the 15-year-old, free-for-all ArtsGoogle blends a lively street party with visual, music, and performance art of all varieties. Presented by Near Southside, Inc., the free fest showcases the work of over 850 talents — novice to career — in an environment that’s the polar opposite of a self-serious, juried show. That said, attendees won’t find scented candles or kitschy tchotchkes. Instead, the 45,000-strong crowd can discover artists of all experiences and skill levels sharing their passion. Spread out over 18 blocks just south of the city’s central business district, the event also features over 50 bands playing inside and on the surrounding rooftops to lend a celebratory soundtrack.